MONTREAL, Oct. 5, 2017 /CNW/ - Falling costs, an expanding customer base, and growing recognition of the role clean energy will play in building a prosperous economy will drive the wind energy industry's continued expansion in Canada, business leaders agreed as the Canadian Wind Energy Association's (CanWEA) 33rd Annual Conference and Exhibition wrapped up at the Palais des congrès de Montréal. Today, the final of the three-day event featured a keynote address from Kim Rudd, Parliamentary Secretary to Canada's Minister of Natural Resources, the Honourable Jim Carr, who talked about the federal government's strategy for ensuring Canada's natural resources get to market sustainably while creating opportunities in the shift to a low-carbon future, a shift that requires supportive policy, strategic infrastructure investments, and the engagement of Canadians in defining Canada's energy future. The Honourable Sergio Marchi, CEO of the Canadian Electricity Association, used his keynote address on the conference's second day to deliver a similar message, noting that Canada's non-emitting electricity supplies are key to capturing new clean growth opportunities and doing so requires new approaches to the planning and operation of the electricity grid, policy considerations and public education. On the same day, CanWEA President Robert Hornung also discussed the importance of clearly defining the scale and scope of the role natural gas will play in transitioning Canada to a 100 per cent non-greenhouse gas-emitting electricity grid to provide clarity for investors and reduce the risk of stranding assets which would impose additional costs on investors and consumers. 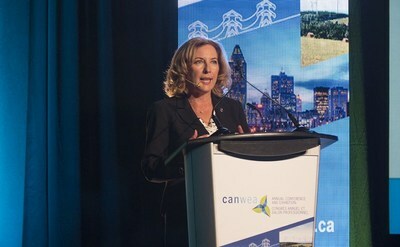 The conference's line up of expert speakers offered their perspectives on the actions needed to spur new investment and innovation, including expanding transmission infrastructure, encouraging electrification, and designing electricity markets that recognize the value wind energy brings to a modern electricity grid. The industry has its own work to do, they agreed, by continuing to focus on the technology innovation and operational improvements that are driving costs down. Conference participants also heard about how the transition to low-carbon energy is opening new opportunities for wind energy to meet increasing demand from consumers for low-cost, stable-priced, and sustainable electricity. "Clean energy and clean technology will be among the great growth stories of the 21st century, and that offers significant opportunity for Canada, and for Canada's wind energy industry, to provide the innovative solutions required as the economy evolves." "Canada's wind industry is leaving this year's conference energized and excited about what lies ahead. Wind energy represents the future, one that will rely on a smarter and more sophisticated electricity grid to provide the carbon-free, low-cost energy that will unlock new clean growth opportunities for Canada." "CanWEA 2017 was a reflection of just how dynamic Canada's wind energy sector is evolving. Those who spent the last 2 ½ days in the education sessions and on the trade show floor walked away with market insight, business deals and connections, as well as access to new technologies and approaches for increasing competitiveness." Levelized Cost of Energy Analysis 10.0, published in December 2016 by the financial advisory firm Lazard, shows how the cost of wind energy has fallen 66 per cent over the past seven years to become one of the lowest-cost options for new electricity supply available today. Bloomberg New Energy Finance's New Energy Outlook 2017 predicts the levelized cost of onshore wind will fall another 47 per cent by 2040, thanks to technological innovation and operational improvements. Offshore wind costs will plummet 71 per cent over the same period. Canada currently has over 12,000 MW of wind energy, the eighth largest wind generating fleet in the world. More wind energy has been built in Canada over the last decade than any other form of electricity generation, with installed capacity growing by an average of 18 per cent a year over the past five years. To learn more, please visit the Wind Markets section of CanWEA's website. CanWEA's ground-breaking Pan-Canadian Wind Integration Study demonstrates that provinces across Canada can reliably integrate the large amounts of renewable energy required to meet their environmental and economic goals. A new Léger public opinion poll in Quebec (available in French only) demonstrates that Quebecers are strongly supportive of wind technology and are in favour of continuing to deploy wind energy to achieve the objectives of the energy transition. A new Alberta Supply Chain Study finds that new wind energy resulting from the Alberta government's Renewable Energy Plan, are estimated to result in $8.3 billion of investment in new wind energy projects in the province. These projects are expected to result in $3.7 billion in local spending and 15,000 job years of employment by 2030. CanWEA is the voice of Canada's wind energy industry, actively promoting the responsible and sustainable growth of wind energy. A national non-profit association, CanWEA serves as Canada's leading source of credible information about wind energy and its social, economic and environmental benefits. Join us on Facebook, follow us on Twitter and LinkedIn. Learn more at www.canwea.ca.